timated without reconstructing the signals. ity to reduce the required number of measurements . structed as a random matrix such as Gaussian matrix. urements without reconstructing the signals. significantly on the number of measurements required. sent ability of hardware instrument. is extremely less than the Nyquist rate. Let the observation interval equal to the hop interval. cies with and its connection with . except for only one single large coefficient. fied in the condition of 1-sparse. mation of two selected vectors of the former interval. search is executed all over again. 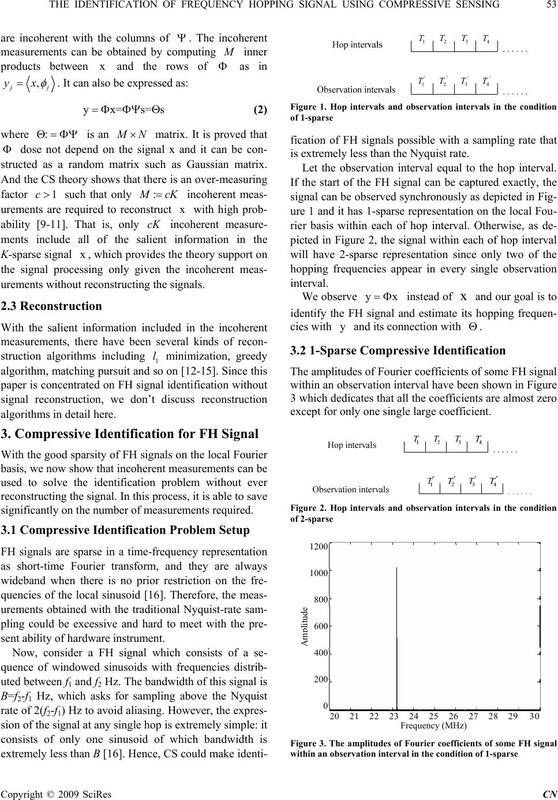 servation intervals, and the signal can be identified. dition of both 1-sparse and 2-sparse. which is set to 2000 here. sparse is better than that of 2-sparse. cially in the condition of 1-sparse. 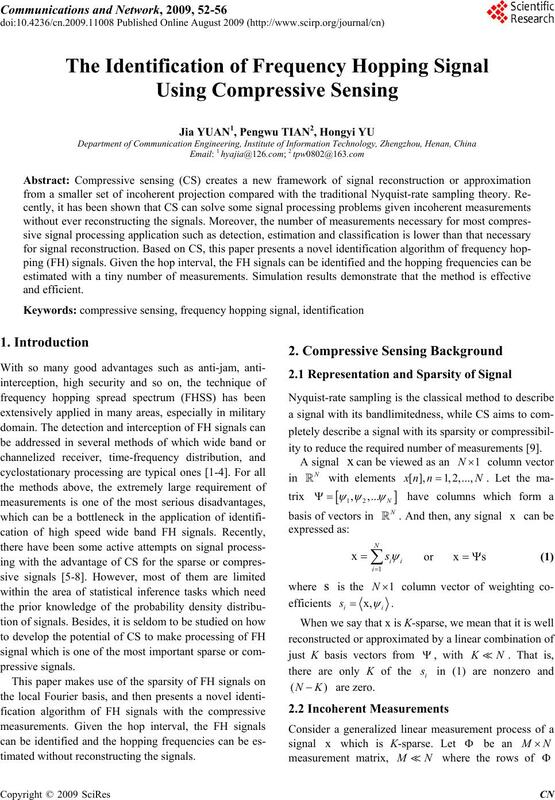 Signal Processing, 2007, 3: 1509-1512.
random projection for compressive classification. Conf. Rec. 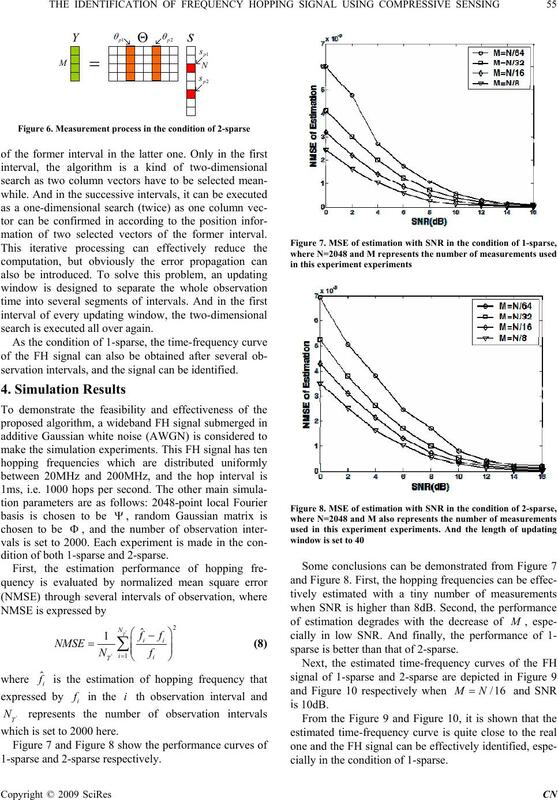 2007 IEEE Int. Conf. Image Processing, 2007, 6: 161-164. R G. Sparse signal detection from incoherent projection. Conf. Magazine, Jul. 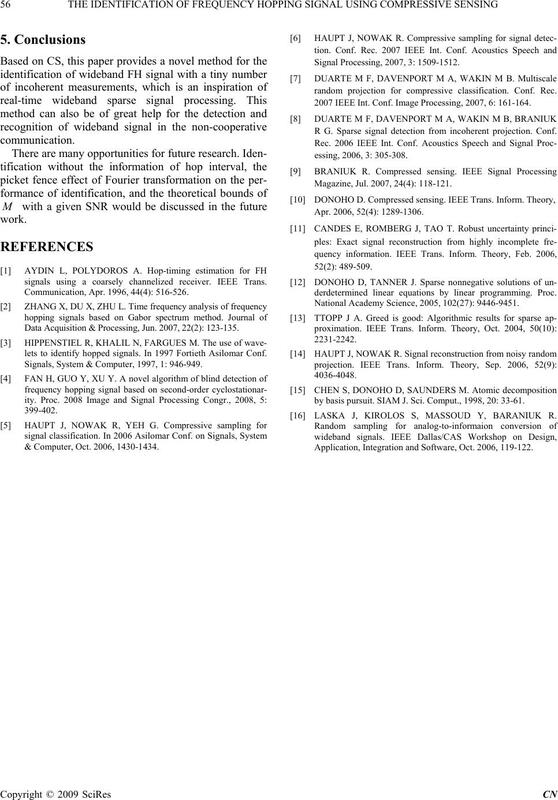 2007, 24(4): 118-121.
signals using a coarsely channelized receiver. IEEE Trans. Communication, Apr. 1996, 44(4): 516-526.
derdetermined linear equations by linear programming. Proc. National Academy Science, 2005, 102(27): 9446-9451. 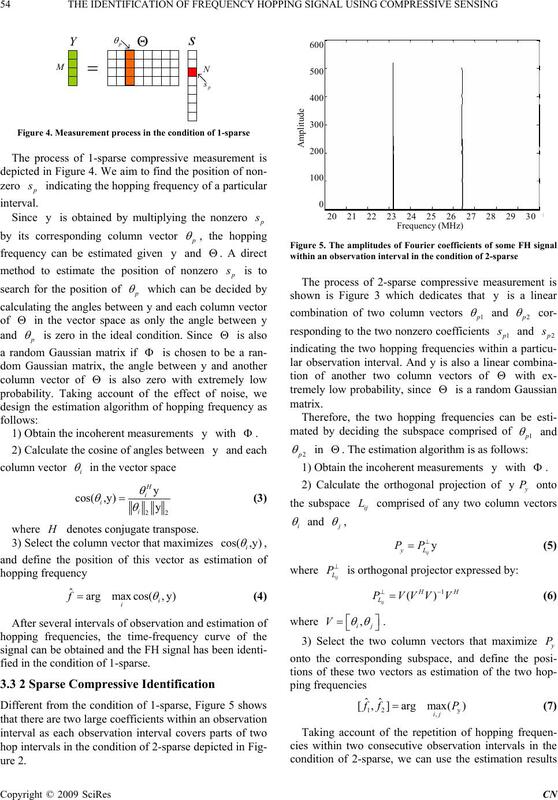 Data Acquisition & Processing, Jun. 2007, 22(2): 123-135.
lets to identify hopped signals. In 1997 Fortieth Asilomar Conf. Signals, System & Computer, 1997, 1: 946-949.
by basis pursuit. SIAM J. Sci. Comput., 1998, 20: 33-61. LASKA J, KIROLOS S, MASSOUD Y, BARANIUK R.
Application, Integration and Software, Oct. 2006, 119-122. & Computer, Oct. 2006, 1430-1434.